The Shoo Fly train ran over him. Wilson Mirror, 30 August 1893. On 11 April 1878, Hilliard Hunter, 26, of Nash County, married Mary Jane Pitt, 25, of Wilson County, in Toisnot township. In the 1880 center of Toisnot township, Wilson County: farm laborer Hilliard Hunter, 25; wife Mary J., 27; and son Walter, 5 months. 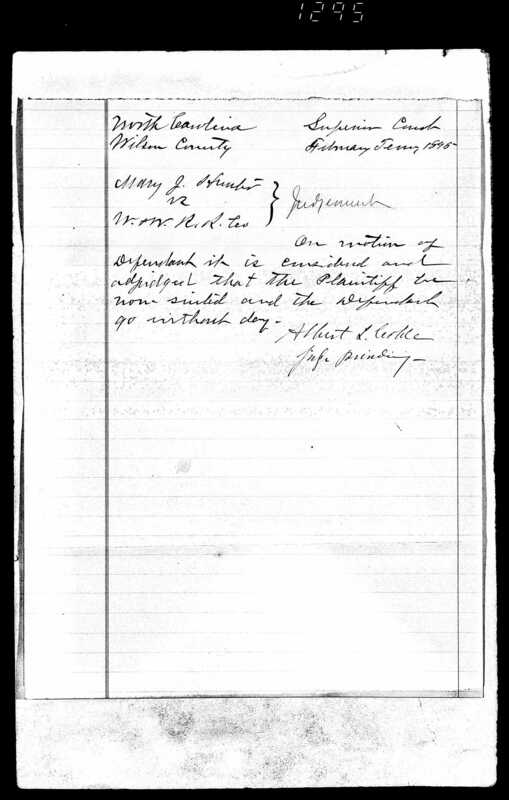 In 1893, Mary Jane Hunter filed an unsuccessful suit against Wilmington and Weldon Railroad over her husband’s death. On 6 July 1899, Turner Anderson, 21, married Lillie Hunter, 20, in Toisnot township in the presence of Annie Bryant, Martha Modica and Nancy Deans. On 2 August 1903, Mary Jane Hunter, 40, of Elm City, daughter of Moses and Marina Pitt, married Daniel Foster, 45, of Elm City, son of Austin and Rachael Foster of Kansas at George Barnes‘ in Toisnot township. Red Batts applied for the license. On 12 July 1905, Willie Hunter, 22, of Elm City, son of Hilliard and Mary J. Hunter, married Mary Whitehead, 20, of Wilson, daughter of Ben and Francis Whitehead, in Toisnot township. T.H. Nicholson applied for the license, and the ceremony took place at Ben Drake’s in the presence of T.H. Nicholson, William Short and W.A. Whitfield. In the 1910 census of Toisnot township, Wilson County: on Elm City-Stantonsburg Road, widowed farm laborer Mary J. Hunter, 40, and daughter Alice, 20, a laundress. On 18 January 1914, Arthur Hunter, 20, of Toisnot, son of Mary J. Hunter, married Estelle Wooten, 24, of Toisnot, daughter of Linda Wooten, in the presence of Turner Anderson, Lillie Anderson and Clarence Wiggins, all of Elm City. On 23 March 1915, Liza Hunter, 20, of Elm City, daughter of Hilliard Hunter and Mary J. Pender, married Jim Pinkney, 21, son of Henny and Hilly Pinkney, in Johnston County. On 14 September 1921, B.S. Jordan, 58, son of Hardy and Mary J. Jordan, married Lilly Anderson, 39, daughter of Hilliard Hunter and Mary J. Hunter, at Lilly Anderson’s in Toisnot township. Wiley Locus applied for the license, and Baptist minister Elias Lucas performed the ceremony in the presence of L.A. Johnson and Bud Simms of Wilson and Hamp Mordcia [Modica] of Elm City. Willie Hunter died 28 April 1960 at Mercy Hospital. Per his death certificate, he was born 18 February 1884 in Wilson County to Hilliard Hunter and Mary Jane [last name not listed]; lived at 204 South East Street; and worked as a laborer. Informant was Doris H. Wilson, 204 South East Street. Eliza Pinkney died 10 July 1969 in Wilson. Per her death certificate, she was born 12 June 1898 in North Carolina to Hilliard Hunter and Mary Jones; resided in Elm City; was married to Jim Pinkney; and was buried in Elm City cemetery. Doretha H. Farmer, 706 East Green Street, was informant. White Swamp runs about 5 miles south of Elm City. The regular daily Norfolk-to-Wilmington passenger train was known as the Shoo Fly. In 1906, the train had a cataclysmic accident near Warsaw, Duplin County. After, a ghost train legend grew in the area. Wilson Daily Times, 15 October 1918. 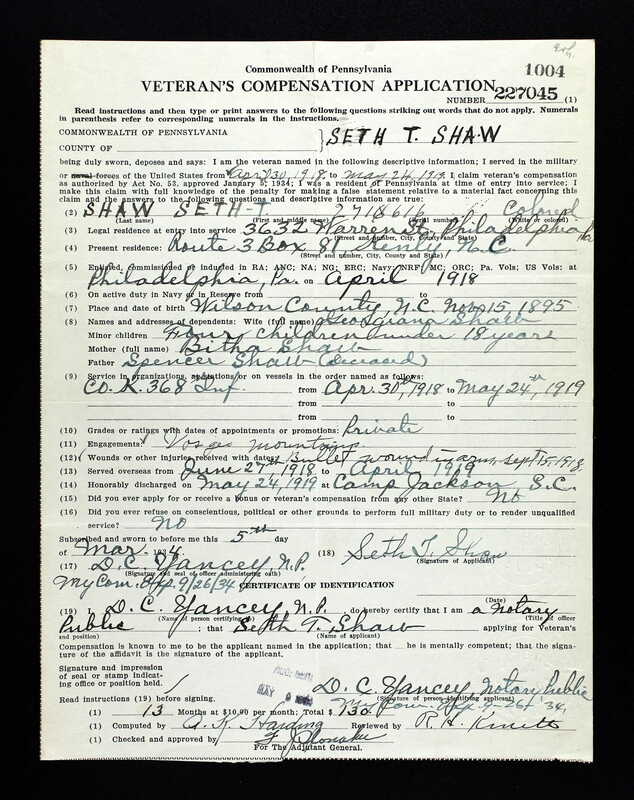 In 1918, Seth Thomas Shaw registered for the World War I draft in Philadelphia, Pennsylvania. Per his registration card, he resided at 3631 Warren Street, Philadelphia, and worked for Eddystone Ammunition Company, Eddystone, Pennsylvania. Seth T. Shaw’s military discharge card. Seth T. Shaw’s application for a Victory Medal, filed 20 June 1921. In the 1930 census of Springhill township, Wilson County: on Buckhorn [illegible] Road, Spencer S. Shaw, 70, wife Bytha J., 70, sons William H., 24, and Seth T., 34, daughter-in-law Georgeanna, 24, and grandchildren Alice M., 4, Seth T., 2, and Franklin S., 6 months. In the 1940 census of Springhill township, Wilson County: Seth T. Shaw, 44, wife Georgiana, 34, mother Bitha, 79, and children Alice M., 14, Seth T., 12, Franklin G., 10, George C., 7, Daisy May, 5, and James C., 3. Seth T. Shaw died 22 December 1981 at a Veterans Administration hospital in Salem, Virginia. Per his death certificate, he was born 15 November 1895 in North Carolina in Spencer Shaw and Bitha Richardson; was married to Georgia Shaw; and worked as a farmer. Obituary of Lillie Mae Barnes Edmundson, age 99. Studio shots, no. 40: Mamie Ellis Maryland. In the 1920 census of Wilson township, Wilson County: on New Stantonsburg Road, farmer Sherrod Ellis, 49; wife Elizabeth, 44; and children Lillie, 18, Joe, 16, Mamie, 13, Mattie, 9, Oscar, 5, and Johnnie J., 2. On 1 January 1925, Richard Maryland, of Gardners township, 21, son of John and Maggie Maryland, married Mamie Ellis, 17, of Gardners, daughter of Sherrod and Elizabeth Ellis, in Wilson. Sherrod Ellis applied for the license, and Rev. C. Barnes performed the ceremony in the presence of Ned Barnes, O.M. Ellis and Elliott Pope. In the 1930 census of Toisnot township, Wilson County: on Rocky Mount and Town Creek Road, John Maryland, 58; wife Maggie, 49; son Richard R., 26; daughter-in-law Mamie, 23; and grandchildren Dacey L., 6, and Willie C., 4. In the 1940 census of Toisnot township, Wilson County: Richard Maryland, 36; wife Mamie, 34; and children Dasie Lee, 14, and Willie C., 12. Mamie Maryland died 8 March 1944 in Sharpsburg, Toisnot township, Wilson County. Per her death certificate, she was born 7 June 1907 in Wilson County to Sherrod Ellis and Elizabeth Barnes; was married to Richard Maryland; worked as a farmer; and was buried in Sharpsburg cemetery. 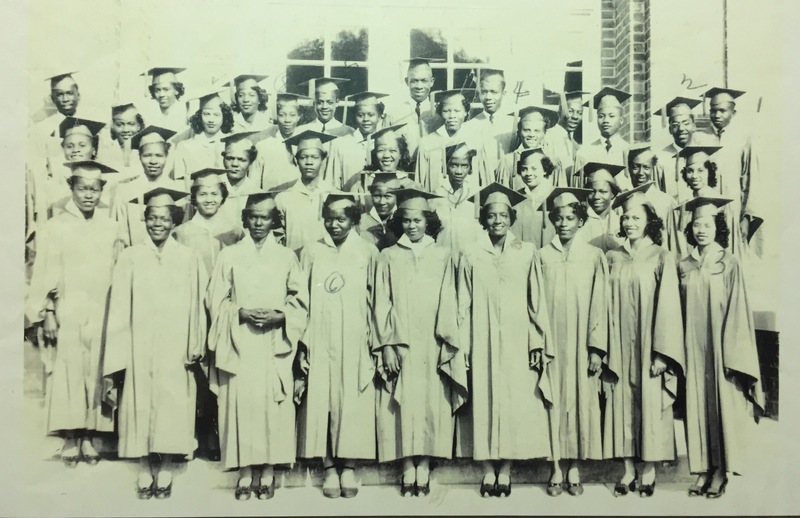 First row: Elizabeth C. Edwards (1929-? ?, daughter of Rosa L. Edwards); Lenore McCoy; Annie Doris Battle; Merline Hussey Brooks; Trumiller Beatrice Wimberly; Henrietta Hines McIntosh (1927-? ?, daughter of Charlie and Eva Hines); Doris Vivian Smith; Pauline Lorine Coley Ellis (1928-? ?, daughter of Alonzo and Pauline McQueen Coley); Christine Margaret Snow. Second row: James Douglass George (1926-? ?, son of Walter D. and Eunice George); Helen Grey Woodard Travis (1931-1999, John and Emilie Woodard); Doris Simms; Jean Orlmiller Gilchrist (daughter of Cannon and Ruth Norfleet Gilchrist); Mamie Ruth Ellis (1930-? ?, Oscar and Mamie Bynum Ellis); Daisy Hilda Winstead Hinnant Brooks (1928-1979, daughter of Sam and Mattie Pope Winstead); Mary Magdalene Knight Lathan (1930-2012), daughter of Johnnie and Gertrude Thomas Knight); Grace Emily Hodges Dunlap (1930-2008, daughter of Nathaniel and Bessie Sutton Hodges); Mary Frances Diggs Hargis (1930-1971, daughter of Edgar and Mary Grant Diggs); Agnes Marie Hoskins (1929-? ?, daughter of Lonnie and Gertrude Simms Hoskins); Ozie Lee Pender Hobbs (1928-2010, daughter of Albert and Mary Pender); Winford Lee Morgan (1931-2000, son of James and Addie Fisher Morgan). Third row: Charles Seville Plater (1929, son of Simon T. and Ruth Jones Plater); Commillus Woodard (1928-1994, son of James and Geneva Powell Woodard); Charles Edward Hines (1929-? 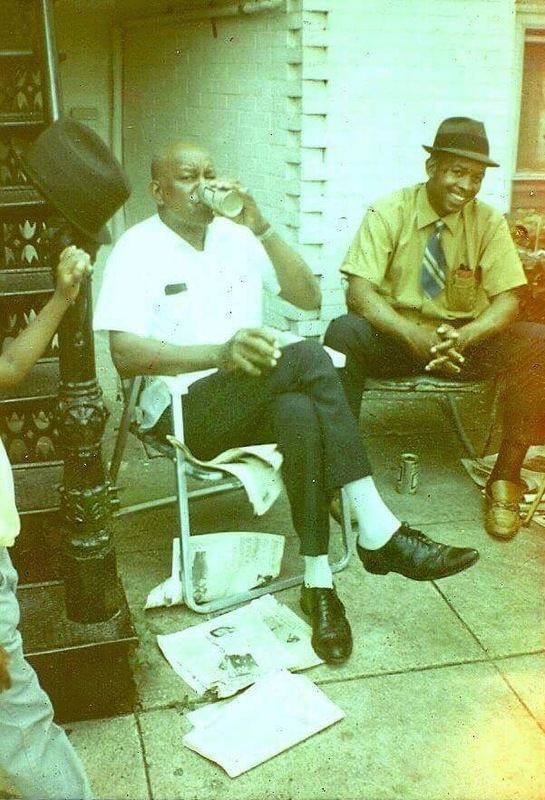 ?, son of Wesley and Lucy Ellis Hines); Freddy Blue (1927-? ?, son of Joe and Lula McNeal Blue); Willie Jones; James Melvin Barnes; William Taft Williams Jr.; Annie Miller Stokes (1930-? ?, daughter of James and Viola Reese Stokes). Fourth row: Edwin Dawson; Wade Nicholas Lassiter (1928-? ?, son of Jesse C. and Lessie Dew Lassiter); Edward Kerphew Harris (1930-2007, son of Benjamin and Pauline Artis Harris); James Henry Spivey (1930-? ?, son of Henry and Mary Clarks Spivey); Beatrice Wendella McNeil Hines (1928-2007, daughter of Matthew and Ola Belle Jiggette McNeil); Jesse Adam Henderson (1929-2003, son of Hattie M. Henderson Ricks and Roderick Taylor Sr.); Ralph Cornell Gay (1928-1992, son of Albert and Annie Bell Jacobs Gay); James Nicholson Jr.; Leotis Reid (1926-2011, son of Oscar and Nora Artis Reid); Richard Lee Barnes; Walter Harold Canady; Nathaniel Webster Mewborn. Wilson Daily Times, 6 August 1918. Henry Tart, who requested an increase in the fees he charged for hauling baggage. The colored fire department (the Red Hots), who requested funding for firemen’s tournaments. Obituary of Margaret Davis Taylor, 105. In the 1910 census of Wilson township, Wilson County: on County Line Road, Ellen [sic] Evans, 39; wife Eliza, 25; son Thomas, 18; mother Harriet, 69; sister Dora Davis, 28, a widow; and her children Levi, 14, Ivy, 12, Lillie, 10, Mamie, 5, and Margaret, 2. In the 1930 census of Taylors township, Wilson County: Isaac Strickland, 40; wife Dora, 50; mother-in-law [actually, step-daughter] Margret Davis, 23, and her son Elgin, 2; and [step-] daughters Henrietta, 18, and Mamie Davis, 24. Leroy Taylor, 33, of Wilson County, son of Herbert and Bertha Taylor, married Margaret Davis, 26, of Wilson County, daughter of John and Dora Davis, on 26 May 1934 in Nashville, Nash County.